The experience of the protests in Iran’s streets is very different from the reports we are getting in the state media. 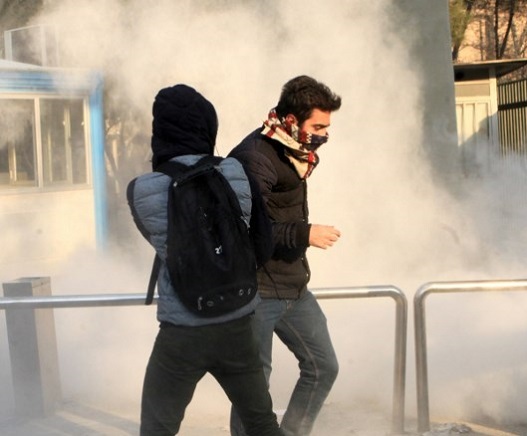 What is going on in the streets of Iran? Are they chanting slogans against the government? Are protesters demanding regime change or are their demands related to the ailing economy, unemployment and hunger? Are protesters chanting in support of the late deposed monarchy or some form of a republic? Since noon of the second day of protests they cut off the internet. Satellite news reports that only Telegram and Instagram are being blocked but in many regions of the country they have cut off internet services completely. They are not only blocking user’s access to the World Wide Web, but users have a difficult time connecting even to the state-made network of National Internet, state websites and news channels. So I head out of the house to follow the protests. While there is daylight, there is no trace of any protest. In some cities of the country protests start around 11 am but in many protesters wait for the safety of darkness to get to the streets. The evening is also when people return from work so there is a better chance of gathering in larger groups. The heavy evening traffic also restricts the movement of security forces and reduces the quality of photographs that could be used to later identify protesters. Despite the persistence of serious street protests in the past several days, until the fourth day of protests, there was not a significant number of security officers on the streets. It appears that the police have decided to avoid confronting people. People can be heard commenting on the lack of police presence saying: “They are scared!”; “Their days of bullying is over!” This changed and by the fifth day, the security presence increased with anti-riot police, plain cloth Basiji militias and security agents. It is not clear where the tires come from. They are set on fire locking the intersection. Traffic signs are uprooted and transferred onto the road. The road is blocked and fires are aflame to help overcome the tear gas and paper sprays the crackdown forces use. Anti-riot forces focus on those who go beyond chanting. They have no mercy. The ruckus sends people running and docking. Some say it is audio grenade blasts. Then someone falls. There are al least 25 shots within 10 seconds. Those with economic demands do not fear batons but they flee at the sound of shots. “They won’t give up until we’re eliminated; we are dispensable!” A few continue chanting against the system; the government and the rich and the main slogan persists: “I will kill those who kill my brother!” Those in vehicles who do not want to join the crowd; slow down in support of the protesters and begin to honk so traffic becomes denser and protesters gain confidence. Women are a clear force and they can often be seen trying to convince their fathers or husbands to join the protests. What of the Pahlavi Dynasty and Rajavi Supporters? I have not heard any slogans for or against People’s Mujahedin of Iran (MKO) so I cannot comment on that but from every four slogan one pertains to the Pahlavis and they mostly express support for Reza Shah rather than his son; Mohammadreza Pahlavi. In general; slogans that sound rhythmic and smooth are echoed; “Students; Workers; United; Unite!”. When I ask one who appears to be a leader what are you demanding? monarchial regime or a republic? He says “I don’t know. We choose slogans that are being used in other places. We want a government the works; no corruption; affordable prices; no prohibition against alcohol; no harassment by the police; no jailing of political activists; no killing of the people;…” His words are in effect completed by several people surrounding him. It is notable that it has become hard to distinguish between regular civilians; officers and the plain clothes forces that have been often rallied by agents of the state to confront protesters. The latter are now donning masks. They are there beside anti-riot police looking on but not doing much. They sometimes attack protesters with batons and cables but they no longer act without police presence. This change from their usual mode of free action is under dispute among the people. Some say this time they have realized its for real; others say they don’t want to avoid provocation; others say they are now in the stage of identifying protesters. Another view is that they no longer know what is the right approach. An eight year old girl distributes bottled water among the tired and thirsty protesters. When empty she takes them to a nearby home and fills them up with water from their tap. Her parents watch from afar as she goes about her work. They say they tried to keep her inside but she screamed and demanded to be let out so they had to submit to her will. A woman wearing a chador (full coverage hijab) with her daughters are among protesters. Her daughters do not wear the chador. The woman only echoes “death to Khamenei!’ and “Death to Dictators!” A young man respectfully says: “Ma’am! Isn’t this all your fault! Did you not give the lead to the mullahs and bring this misery upon us!” She responds without losing composure: “We are now here to fix it!” and she continues with her chants against the regime. A young man goes from car to car shouting: “What are you afraid of? Are you satisfied with this situation? Have you got no honour? Come on out onto the street. What are you doing in your cars? What do you think; beating of your fellow citizens is a movie to watch? You think you’re in the cinema? Come on down. This is a revolution…” His persistence does actually get some people to pull hand break and get out of their cars. A young man ten metres from where over 500 hundred anti-riot police are stationed is shouting from the top of her lungs: “I’m not afraid of you!” He picks up a brick and hurls it at them. The police advance a step but he does not move. He then turns to some protesters a few metres further saying: “Have no fear; come one; they are done for!